One of the most significant objectives of any zoo is to educate its visitors and this is something we strive for at The Australian Reptile Park. This is none-more-evident in exhibits that house a variety of different species. This allows our animals to form bio-communities and truly thrive in a natural exhibit, but of course it comes with risks. Keepers need to ensure species mix correctly and that any potential predators are not housed with prey, this takes years of research and relationship building with individual animals to understand each unique personality trait. 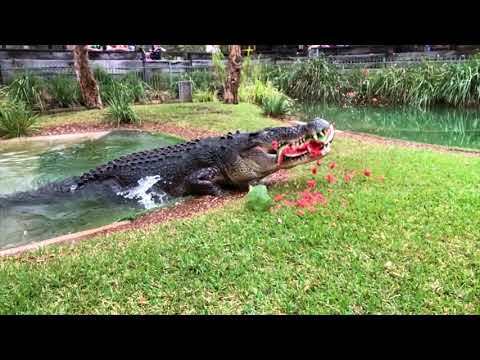 Our mixed-species exhibits at The Australian Reptile Park provide the animals, visitors and park keepers with an interactive and dynamic experience. The animals are offered enrichment through interspecies interactions whilst visitors learn from observing these exchanges and appreciate increased action in each exhibit. Our keepers are challenged with management of these exhibits, which may comprise of a variety of species including mammals, birds and reptiles. The exhibit showcased in this video highlights many species living together in harmony and interacting with each other. Yellow footed rock wallabies, pademelons, Australian bustards, Eastern water dragons as well as many native birds can all be seen at various times of the time-lapse flitting in and out of the frame. It’s truly fascinating watching the animals going about their daily routine – see how many you can spot! Vulnerable species moves into Australian Reptile Park Cuteness alert – Baby Tassie devils!